Around The Garage Off-Topic conversations here! Anyone tell me how to check the taper of the ball joint studs? So, I'm thinking what about reaming the bottom ball joint hole out a hair to accept the larger Foreman ball joint, allowing me to use the dozen or so Foreman 500 knuckles I have on hand? I held the two ball joints up side by side today (51355-HP5-601 and 51375-HP5-601) and the latter has a slightly bigger diameter on the barrel. I'm guessin (will check after work) that the stud is also slightly larger, so how do I tell which tapered reamer I would need. It appears most automotive use a 7 degree, but there are other's availabe. Any machinists here who know? ahhh...the joy of slapping parts from other makes and models..gotta love it. I would think the threaded part would be the same ?. as for the ball joint hole in knuckle ?, you could always just grind the hole larger ?. myself ?..nope..stock sure saves the headache !!..lol. I'm looking at the bottom a-arm hole vs the ball joint stud. The 500 knuckle takes the bigger ball joint, The 420 knuckle takes a smaller ball joint. The nut on both is the same, but I think the stud on the bigger ball joint is bigger where it goes in the hole in the a-arm. That said, if I can find the proper reamer I could ream the hole out a little bigger and use the 500 knuckles. yeah, if the thread hole is larger ?, you will have to solve that part for sure. Shank is not only bigger diameter, but also longer on the bigger ball joint. Luckily, while digging around looking for Foreman brakes to send to @SamUK I discovered that I did have a set of the OBS 420 brakes after all, so those can go on my kid's 300 (which will require grinding out the upper ball joint hole in the 300 upper a-arm to accept the larger 420 ball joint). Also, PSN had a 33% off sale this weekend and they happened to list a set of 2013 disc brakes Saturday morning so I snapped those up to use on the other 300 I'm going to get going as soon as I finish with my daughter's. 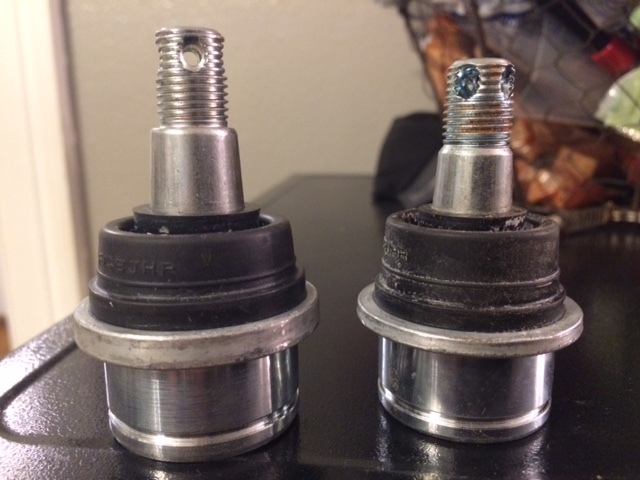 Just in case anyone is wondering, here are pics of the Foreman ball joint and 300 ball joint side by side. PSN was selling the OBS 420 knuckles for $27 and change for a long time. I hoarded several sets, but ended up using them on other people's machines and used them all before I got to my 300's! The set they had Saturday morning did not show up on the "what we bought" list, but I have my ebay set up to notify me when their ebay store lists 420 knuckles, so I got the notification from ebay, then went to PSN's site and bought them using the discount code. The knuckles were listed at $60 each, so definitely not cheap like they used to be, but at 33% off they weren't horribly expensive. Guess that's what I get for using all my cheap parts on other people's stuff! My answer would be, measure the taper and buy and adjustable reamer. Are 450 or 500 the same as 420? I can measure for you if they are. who are you ?, and where have you been ?..hmmm.imposter !? !...lol.